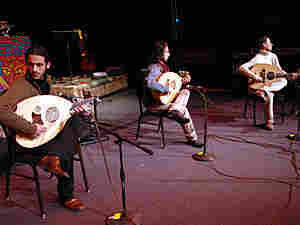 Le Trio Joubran On Mountain Stage The three Joubran brothers of Palestine come from a long line of luthiers. Now, they've taken to playing their ouds as a trio. Here, the group performs its improvisational, virtuosic take on traditional Arabic music. Composed of brothers Samir, Wissan and Adnan Joubran, Le Trio Joubran hails from Palestine. All play various versions of the oud, a string instrument and cousin to the more commonly known lute. The brothers' father, Hatem Joubran, is a renowned instrument builder in their homeland. Wissan continued in his family's long-standing tradition and is now himself a master luthier, building all of the band's instruments. Samir Joubran, the eldest, began as a solo oud artist; his two younger brothers eventually took up the family instrument and joined him to form the first trio of its kind. With startling technique and improvisational flair — the final song here is an improvisation the group played as an encore — Le Trio Joubran performs original compositions inspired by traditional Arabic music.